Draft: 2004, Minnesota Twins, 1st rd. Trevor Patrick Plouffe… He and wife Olivia have a son, Theodore Winston James… Is a 2004 graduate of Crespi Carmelite High School (CA)… Named a 2004 Collegiate Baseball News High School All-American and a USA Today All-American… Signed by: Bill Mele. Combined to bat .198 (56-283) with 9 HR, 19 RBI, and .590 OPS in 100 G last season for Oakland and Tampa Bay…was on A's Opening Day roster, starting 26 of club's 1st 27 G, including Opening Day 4/3 vs. LAA at 3rd base…no multi-hit games until May, when he totaled 3 in a row from 5/7-9…after season-high 3-hit game on 5/18 vs. BOS, batted .127 (7-55) in final 19 G w/ A's (one XBH, 4 BB/20 SO), and was designated for assignment on 6/15…traded to TB in exchange for PTBNL or cash on 6/17… hit .178 (13-73) in 1st 31 G with Rays from 6/19-8/19, and was designated for assignment after game on 8/23…went 5-for-22 in 7 G at Durham (AAA) after being outrighted before contract was purchased by Rays on 9/4…hit .143 (4-28) in 11 G/7 GS the rest of the way to finish season. Batted a career-high .260 with 12 home runs and 47 RBI in 84 games with Minnesota in a season interrupted by three stints on the disabled list…missed a total of 65 games while on the DL and his 84 games played were his fewest since 2011 (81)…struck out 60 times and his average of 5.73 plate appearances per strikeout was the best mark of his career…walked just 19 times and his mark of 18.11 plate appearances per work was the worst mark of his career…hit .266 (65-for-244) against right-handed pitchers compared to .240 (18-for-75) against left-handers…however, had a .781 OPS against lefties and .705 against righties…entered the season with a .235 career batting average against righties, .271 against lefties…batted .225 with the bases empty, .305 with runners on…however, hit .233 with runners in scoring position…had a .308 batting average and six of his 12 home runs with two outs…hit .371 with a home run and 11 RBI in eight interleague games…batted .197 when leading off an inning…appeared in 63 games (60 starts) at third base and 13 games (13 starts) at first base…made six errors as a third baseman (.960 fielding percentage) and one as a first baseman (.991 fielding percentage)…each of his first 40 starts came as a third baseman…also hit .481 with two home runs and seven RBI in seven games as the designated hitter and was 0-for-1 as a pinch hitter…started games in the three through six spots in the order with his most action coming with 45 starts batting clean-up. Made Twins Opening Day roster for fourth straight season; was Opening Day third baseman for third straight season April 6 at Detroit.... Hit first home run of season April 13 vs. Kansas City, the 36th of his career at Target Field, becoming the park's all-time leader in home runs....Hit first career walk-off home run April 17 vs. Cleveland off Bryan Shaw, giving the Twins a 3-2 win in 11 innings.... Hit first career grand slam May 3 vs. Chicago off John Danks...also set single-game career-high with five RBI....Missed one game May 9 at Cleveland, attending funeral of a family member.... Reached base in 24 straight games April 17-May 15, posting a .381 on-base percentage in that span...at the time, it was the second longest active streak in baseball.... Hit .312 (29-for-93) with seven doubles, one triple, five home runs, 21 RBI, 11 walks and 13 runs scored in 25 May games; 21 RBI tied for eighth most in the AL. ...Set single-season career-high with third triple July 4 at Kansas City. A Hit second career grand slam July 17 at Oakland, one of 17 players in baseball to hit two-plus grand slams during the season.... Homered in back-to-back games four different times: May 2-3, July 12-17, July 23-24 and August 16-17.... Placed on Paternity List July 29 to attend birth of first child, Theodore Winston James, born that night.... Recorded third career two-homer game September 11 at Chicago-AL...second home run was his 20th, marking second time in career with 20-plus homers (24 in 2012)...became third Twins third baseman to ever hit 20-plus home runs in multiple seasons, joining Corey Koskie (twice) and Gary Gaetti (6 times).... Hit safely in season-high 10 straight September 9-19, hitting .378 (14-for-37) with three home runs and eight RBI during the streak...Set single-season career-highs in hits (140), RBI (86), runs scored (74), games (152), at-bats (573) and triples (4)....Led Twins in RBI, ranked second in doubles (35), and third in games and hits....Led all AL third basemen in fielding percentage (.977) and ranked second in baseball (minimum 1,100.0 innings played)....Tied for second among AL third basemen in RBI, tied for third in doubles and fourth in extra-base hits (61). Made Twins Opening Day roster for third straight season and was in Opening Day lineup for second straight season, playing third base and batting sixth March 31 at Chicago-AL, going 1-for-4 with a double...Hit safely in first eight games March 31-April 9 and again April 19-30, which proved to be season-high...Hit .307 (27-for-88) with 10 doubles, 19 RBI, 15 walks and 18 runs scored in 23 April games; 10 doubles were tied for second most in the AL and 19 RBI tied for ninth...Tied single-season career-high with 22nd double June 6 vs. Houston; set new career-high with 23rd July 1 vs. Kansas City...Placed on 15-day disabled list June 15 with inflammation between ninth rib and costal cartilage on left side, suffered while diving for a ball the previous game...Tied career-high with four hits August 2 at Chicago-AL, two doubles and two singles...Hit 37th double August 24 vs. Detroit, tying Corey Koskie (2001 and 02) for first on Twins all-time single-season doubles list for primary third basemen...Hit 38th double August 27 at Kansas City, passing Koskie and moving to sole possession of first on that list...Named Co-American League Player of the Week with teammate Danny Santana for the period ending August 24, both players first career honor...Batted .367 (11-for-30) with five doubles, two home runs, 10 RBI and six runs scored; his five doubles were tied for most in baseball during the week...he and Santana were the second and third Twins to win award this season, joining Chris Colabello (April 7)...Hit the 10,000th home run in Twins (since 1961) and Washington Senators (1901-60) franchise history August 29 at Baltimore; coincidentally, hit the 9,999th seven days earlier August 22 vs. Detroit, also hit the 10,001st August 31 at Baltimore...Hit .317 (33-for-104) with 10 doubles, five home runs and 24 RBI in 26 August games; 24 RBI were tied for third most in the AL, while 10 doubles were tied for fourth most...Hit 40th double September 5 vs. Los Angeles-AL, becoming the 18th Twin to hit 40 doubles in a season (20th time), and first since 2010 when Delmon Young (46) and Joe Mauer (43) did it..Tied season and career-high with four hits September 23 vs. Arizona, all singles...Suffered fractured left forearm September 24 vs. Arizona when A.J. Pollack slid into his wrist at third base; missed remainder of season...Had surgery to repair arm September 29...Set career-highs in hits (134), doubles (40), triples (2), RBI (80), runs scored (69), walks (53), games (136), at-bats (520) and total bases (220)...Finished tied for fourth in the AL in doubles and tied for seventh in baseball...Among AL third basemen, ranked first in doubles, fourth in RBI and walks, and fifth in runs scored and total bases...Named Twins nominee for the 2014 Hank Aaron Award...award eventually given to co-winners Philadelphia's Jimmy Rollins and Chicago White Sox's Paul Konerko. Started first ever Opening Day, playing third base and batting sixth April 1 vs. Detroit... Tied career-high with three hits May 8 at Boston; also drove in three runs on the night... Hit safely in eight straight May 12-21 prior to landing on 7-day disabled list with a concussion, he suffered while sliding into the leg of Dan Uggla at second base May 21 at Atlanta. Was reinstated from 7-day DL May 30, strained his left calf that same day and placed on 15-day DL...played four games for Triple-A Rochester on rehab assignment and was reinstated June 14... Hit safely in 21 of 22 games May 12-June 30, including a season-high 12 game hitting streak June 18-30... Recorded first career four-hit game (6 at-bats), including a home run, September 3 at Houston... Hit 20th double September 6 vs. Toronto, setting a single season career-high... Hit .330 (34-for-103) in 27 September games; his 34 hits were tied for third most in the AL. Made Twins Opening Day roster for first time in career. ... Drew 13 walks in 18-game span April 17-May 14. ... Tied career-high with four RBI June 9 vs. Chicago-NL...also set single season career-high with ninth home run. ... Homered in four straight games June 12-15, the longest streak for a Twins player since Jim Thome September 4-11, 2010. ... Set Twins all-time single-season Interleague home run record, hitting his eighth, passing Torii Hunter (7 in 2005) June 15 vs. Milwaukee(he finished with 9). ... Had first two career two-homer games -- June 15 vs. Milwaukee and July 1 vs. Kansas City. ... Set career-high with three walks June 16 vs. Milwaukee. ... Hit one home run in first 22 games April 6-May 14, but hit 18 homers in next 39 games May 16-July 3. ... Batted .327 (32-for-98) with 11 home runs, 21 RBI, 22 runs scored and a .735 slugging percentage in 26 June games...his slugging percentageranked second in American League and his home runs were tied for second over that same span. ... Hit safely in career-high 17 games June 30 (Game 1)-July 19, batting .328 (22-for-67) in that span. ... Placed on 15-day disabled list with bruised right thumb July 27...returned from rehab at Triple-A Rochester and reinstated August 13. ... Hit 20th home run August 29 vs. Seattle, becoming first Twin to have 20-plus homers in rookie or year-after-rookie season since MartyCordova won the AL Rookie of the Year Award with 24 home runs in 1995 (Elias Sports Bureau). ... Finished second on the team in home runs with 24, 18 being solo shots; hit 12 homers off lefties and righties each. Started the season with Triple-A Rochester...played in 21 games for the Red Wings, batting .282 (22-for-78) with four doubles, six home runs and 13 rbi...recalled by Minnesota, May 4...Hit a home run in his first Major League at-bat of the season, a solo shot off Tim Wakefield, May 6 at Boston...finished the game 2-for-4 with three runs scored and a stolen base...Drove in eight runs in a three-game span, May 18-20, including consecutive three-rbi games, May 18 and 19 at Oakland...homered in consecutive games, May 19 at Oakland and May 20 at Arizona...Optioned to Triple-A Rochester, as Minnesota called up outfielder Brian Dinkelman, June 2...Batted .333 (38-for-114) with seven doubles, nine home runs and 20 rbi in 30 games with the Red Wings...recalled by Minnesota, July 14...Started his first career game in the outfield (playing right field), July 15 vs. Kansas City...Posted two career-high seven-game hitting streaks, August 10-20 and again August 28-September 4...Hit safely in 19 of 21 games, August 10-September 4, batting .314 (27-for-86) in that span...Recorded a career-high with four rbi, September 3 at Los Angeles (AL)...Had the game-winning walk-off single in the Twins final game of the season (1-0), driving in Denard Span in the bottom of the ninth inning, September 28 vs. Kansas City...Played five different positions defensively for the Twins: 45 games at shortstop (all starts), 17 games at second base (15 starts), 11 games in right field (nine starts), three games in left field (two starts) and one game at first base...His eight doubles in September set a Twins rookie record for most doubles in the month...Combined to bat .268 (128-for-478) with 29 doubles, four triples, 23 home runs, 64 rbi and 80 runs scored in 132 games between Triple-A Rochester and Minnesota...his 23 home runs led the Twins organization and his 234 total bases ranked fourth. Started the season with Triple-A Rochester and played in 39 games for the Red Wings before being recalled, May 21...Played in his first Major League game, starting at shortstop, May 21 vs. Milwaukee...went 2-for-5 in that game with a double, a run scoredand two rbi...singled off Dave Bush for first Major League hit...Played in three games for the Twins (all in the Milwaukee series, May 21-23) before being optioned to Rochester, May 25...Recalled, June 11...played in four games before being optioned, June 19...Hit seven home runs with 15 rbi in 93 at-bats for the Red Wings in July...recalled, July 30...Hit his first career home run (off Fausto Carmona), August 7 at Cleveland...optioned to Rochester, August 10...Recalled, September 1...finished his season at Rochester batting .244 (98-for-402) with 22 doubles, four triples, 15 home runs and 49 rbiin 102 games for the Red Wings...hit .295 (46-for-156) with runners on base...Appeared in 12 games for the Twins in September, being used almost exclusively as a pinch-runner...Hit his second career Major League home run, October 1 vs. Toronto...finished the season with 17 home runs between Rochester and Minnesota...Named to the Minor League Baseball website's 2010 Twins organizational All-Star team. Spent entire season at Triple-A Rochester...was the youngest member of the Red Wings Opening Day roster...hit a home run in his first game, April 9 at Syracuse...hit a first inning grand slam, May 24 at Norwich...hit a two-out, two-run walk-off home run, June 2 vs. Gwinnett...went 4-for-4 with a double and a home run, August 29 vs. Buffalo...collected four three-hit games on the season, May 8 vs. Charlotte, June 17 at Columbus, July 6 vs. Buffalo, and August 2 vs. LeHigh Valley...hit .314 (27-for-86) with 12 rbi and 18 runs scored in 27 games in August...batted .538 (7-for-13) with the bases loaded...his 10 home runs were the most he had in a season since 2005, when he hit 13 for Beloit...played 118 games for the Red Wings, including 112 at shortstop...led all International League shortstops in total chances (542), putouts (86), errors (26) and double plays (84). Began season at Double-A New Britain...recorded first four-hit game of season, April 12 at Portland, driving in four and scoring three runs...had four straight multi-hit games, April 20-23...hit safely in eight straight games, April 26-May 4...promoted to Rochester, June 13...hit .440 (11-for-25) with seven rbi, four doubles and seven runs scored, July 20-28...finished with 20 multi-hit games for the Red Wings...played 32 games at third base, 20 games at second base and 12 games at shortstop for Rochester...hit .307 (39-for-127) off lefties between Double-A and Triple-A...ranked 10th best prospect in Twins organization by Baseball America entering the 2009 season. Spent entire season at Double-A New Britain...four-hit game, April 26 vs. Portland...finished April hitting .310 in 14 games...named Twins'Minor League Player of the Week, April 27-May 3, hitting .476 (10-for-21) with two doubles, two home runs and five rbi...second four-hit gameof season, May 28 at Harrisburg and earned Eastern League Player of the Week, May 28-June 3, while hitting .441 (15-for-34) with five doubles,one home run, eight runs and six rbi...hit safely in nine straight games, May 31-June 8...hit safely in 12 straight games, June 18-28...hit .325(38-for-117) with four home runs, 15 rbi, five doubles, two triples and 17 runs scored in 28 June games...hit .310 (31-for-100) with 18 runsscored in 27 July games...finished with 11 games of three-or-more hits...was second on club in hits (136) and third in league in doubles (37)...participated in the Arizona Fall League, hitting .280 (14-for-50) in 15 games for the Phoenix Desert Dogs...was tied for 11th in all of the minorswith 15 sacrifice hits...ranked 10th-best prospect in the Twins organization by Baseball America, entering the 2008 season. Spent the entire season at Single-A Ft. Myers and hit safely in nine of his first 11 games, including a three-hit game, April 10 at Tampa...had nine-game hit-streak from June 11-26, including his first home run June 20 vs. Lakeland...hit safely in 13 of 14 games from August 4-17,batting .356 (21-for-59) with seven multi-hit games...hit in seven straight from August 22-28 with two home runs and five rbi...hit .304 (35-for-115) with 13 rbi and 20 runs scored in 30 August games...led club in doubles (26) and was third in hits (112) and runs scored (60). Spent entire season at Single-A Beloit...hit first home run, April 10 vs. Quad Cities...hit safely in nine straight games, June 9-17, batting.382 (13-for-34) with two home runs, six rbi and five runs scored...first four-hit game, July 4 at Wisconsin...four straight multi-hit games, July14-17, including two three-hit games...hit four home runs in a six-game span, July 30-August 4...finished with 15 multi-rbi games...ranked secondon club in home runs (13), third in runs scored (58) and games (127) and fourth in hits (104)...ranked 12th best prospect in the Midwest Leagueby Baseball America...ranked ninth-best prospect in the Twins organization by Baseball America, entering the 2006 season. Played 60 games with the Elizabethton Twins and hit safely in 48 of those 60...had three-hit game, June 26 vs. Princeton with one homerun and two rbi...had nine-game hit-streak, July 31-August 9, including a four-hit game on August 4 vs. Danville...hit safely in 13 of his last14 games played, including a four-hit game on the last day of the season, August 29 at Princeton...was second on club in hits (67)...rankedsixth-best prospect in Appalachian League by Baseball America. March 21, 2019 Lehigh Valley IronPigs released 3B Trevor Plouffe. 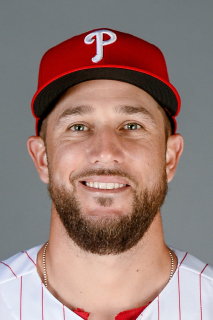 March 21, 2019 Philadelphia Phillies released 3B Trevor Plouffe. February 23, 2019 3B Trevor Plouffe assigned to Lehigh Valley IronPigs. February 21, 2019 Philadelphia Phillies signed free agent 3B Trevor Plouffe to a minor league contract and invited him to spring training. October 5, 2018 3B Trevor Plouffe elected free agency. September 3, 2018 Lehigh Valley IronPigs activated 2B Trevor Plouffe from the 7-day disabled list. August 29, 2018 Lehigh Valley IronPigs placed 2B Trevor Plouffe on the 7-day disabled list. August 5, 2018 Philadelphia Phillies sent 2B Trevor Plouffe outright to Lehigh Valley IronPigs. July 31, 2018 Philadelphia Phillies designated 3B Trevor Plouffe for assignment. July 10, 2018 Philadelphia Phillies selected the contract of 3B Trevor Plouffe from Lehigh Valley IronPigs. April 25, 2018 2B Trevor Plouffe assigned to Lehigh Valley IronPigs. April 23, 2018 Philadelphia Phillies signed free agent 3B Trevor Plouffe to a minor league contract. April 10, 2018 Round Rock Express released 3B Trevor Plouffe. March 26, 2018 Texas Rangers signed free agent 3B Trevor Plouffe to a minor league contract. March 26, 2018 3B Trevor Plouffe assigned to Round Rock Express. February 21, 2018 Texas Rangers released 3B Trevor Plouffe. February 12, 2018 Texas Rangers signed free agent 3B Trevor Plouffe to a minor league contract and invited him to spring training. November 2, 2017 3B Trevor Plouffe elected free agency. September 4, 2017 Tampa Bay Rays selected the contract of 3B Trevor Plouffe from Durham Bulls. September 4, 2017 Tampa Bay Rays activated 3B Trevor Plouffe. August 25, 2017 Tampa Bay Rays sent DH Trevor Plouffe outright to Durham Bulls. August 23, 2017 Tampa Bay Rays designated 3B Trevor Plouffe for assignment. June 19, 2017 Tampa Bay Rays activated 3B Trevor Plouffe. June 17, 2017 Oakland Athletics traded 3B Trevor Plouffe to Tampa Bay Rays. June 15, 2017 Oakland Athletics designated 3B Trevor Plouffe for assignment. January 18, 2017 Oakland Athletics signed free agent 3B Trevor Plouffe. November 19, 2016 3B Trevor Plouffe elected free agency. November 18, 2016 Minnesota Twins sent 3B Trevor Plouffe outright to Rochester Red Wings. October 3, 2016 Minnesota Twins activated 3B Trevor Plouffe from the 15-day disabled list. September 9, 2016 Minnesota Twins placed 3B Trevor Plouffe on the 15-day disabled list retroactive to September 7, 2016. Left oblique strain. August 8, 2016 Minnesota Twins activated 3B Trevor Plouffe from the 15-day disabled list. August 2, 2016 Minnesota Twins sent 3B Trevor Plouffe on a rehab assignment to Rochester Red Wings. July 4, 2016 Minnesota Twins placed 3B Trevor Plouffe on the 15-day disabled list retroactive to July 2, 2016. Fractured left rib. May 3, 2016 Minnesota Twins activated 3B Trevor Plouffe from the 15-day disabled list. April 30, 2016 Minnesota Twins sent 3B Trevor Plouffe on a rehab assignment to Fort Myers Miracle. August 1, 2015 Minnesota Twins activated 3B Trevor Plouffe from the paternity list. July 29, 2015 Minnesota Twins placed 3B Trevor Plouffe on the paternity list. June 30, 2014 Minnesota Twins activated 3B Trevor Plouffe from the 15-day disabled list. June 15, 2014 Minnesota Twins placed 3B Trevor Plouffe on the 15-day disabled list. Inflammation between the ninth rib and the costal cartilage on the left side. June 15, 2013 Minnesota Twins activated 3B Trevor Plouffe from the 15-day disabled list. June 10, 2013 Minnesota Twins sent 3B Trevor Plouffe on a rehab assignment to Rochester Red Wings. May 22, 2013 Minnesota Twins placed 3B Trevor Plouffe on the 7-day disabled list. Concussion. August 13, 2012 Minnesota Twins activated 3B Trevor Plouffe from the 15-day disabled list. August 11, 2012 sent SS Trevor Plouffe on a rehab assignment to Rochester Red Wings. July 27, 2012 Minnesota Twins placed 3B Trevor Plouffe on the 15-day disabled list retroactive to July 21, 2012. Bruised right thumb. August 14, 2011 Minnesota Twins recalled Trevor Plouffe from Rochester Red Wings. August 11, 2011 Minnesota Twins optioned Trevor Plouffe to Rochester Red Wings. July 14, 2011 Minnesota Twins recalled Trevor Plouffe from Rochester Red Wings. June 3, 2011 Minnesota Twins optioned Trevor Plouffe to Rochester Red Wings. May 4, 2011 Minnesota Twins recalled Trevor Plouffe from Rochester Red Wings. March 19, 2011 Minnesota Twins optioned Trevor Plouffe to Rochester Red Wings. October 13, 2010 Trevor Plouffe roster status changed by Minnesota Twins. October 6, 2010 Minnesota Twins reassigned SS Trevor Plouffe to the minor leagues. September 1, 2010 Minnesota Twins recalled SS Trevor Plouffe from Rochester Red Wings. August 11, 2010 Minnesota Twins optioned Trevor Plouffe to Rochester Red Wings. July 30, 2010 Minnesota Twins recalled Trevor Plouffe from Rochester Red Wings. June 19, 2010 Minnesota Twins optioned Trevor Plouffe to Rochester Red Wings. June 11, 2010 Minnesota Twins recalled Trevor Plouffe from Rochester Red Wings. May 25, 2010 Minnesota Twins optioned Trevor Plouffe to Rochester Red Wings. May 21, 2010 Minnesota Twins recalled Trevor Plouffe from Rochester Red Wings. March 20, 2010 Minnesota Twins optioned Trevor Plouffe to Rochester Red Wings. October 19, 2009 Trevor Plouffe roster status changed by Minnesota Twins. September 1, 2009 Trevor Plouffe roster status changed by Rochester Red Wings.